For early-career PhDs, no personal finance topic is more enticing or more intimidating than investing. You know you can’t get ahead financially in the long term without investing… Yet there seems to be so much to learn, and you don’t want to make a misstep! You also have unique concerns as an early-career PhD. Virtually all graduate students and some postdocs are blocked from contributing to their university’s retirement accounts, and many are ineligible to contribute even to Individual Retirement Arrangements! There’s also the “challenge” of your low salary through your graduate student and postdoc years. With little to no help from your employer, how will you figure out how to start investing for your future? 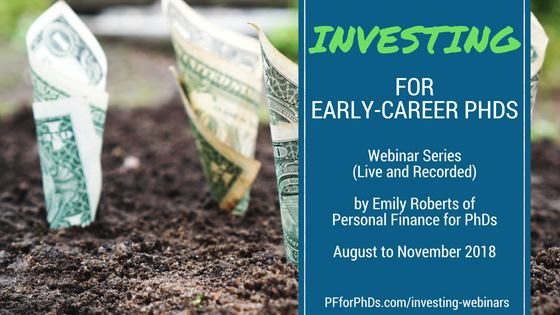 Enter this webinar series, Investing for Early-Career PhDs. I answer the practical questions you have as a novice investor. The series covers how and where to invest, with particular attention paid to the needs of graduate students and postdocs. The earlier you start investing the better; this series will help you break through your analysis paralysis and jump into investing with both feet! The webinars are held on the first and third Saturdays of each month between August and November 2018 at 11:00 AM ET / 8:00 AM PT. There will be approximately 30 minutes of teaching followed by Q&A (60 minutes total). You will receive a link to the live webinar the day before the event. Don’t worry if you can’t make it live! All registrants will receive a link to the webinar recording within 48 hours. A single webinar is $30 to attend live and/or view the recorded version. You can also purchase the complete set of eight webinars for $180 (price of six). 1: Are You Ready to Invest? To responsibly commence investing, you must verify that you are financially prepared. Do you have the savings and cash flow necessary to maintain your lifestyle and simultaneously invest? Would it be more financially or emotionally beneficial for you to invest or pay down debt? Finally, do you have realistic expectations of your investment returns? This webinar details how you determine whether you are ready to start investing. How/when to withdraw money from an IRA. How to “transfer” taxable investments into a tax-advantaged retirement account. When you open an IRA (and often for a 403(b) or 401(k)), you have the choice of opening a traditional version or a Roth version. This webinar covers the differences between those two versions and how to decide which is more advantageous for you. Passive investing is the most effective, least expensive, and most time-efficient method of investing. This webinar explains what passive investing is, its advantages, and why it’s the best choice for an early-career PhD. Other investing methods will be briefly covered to illustrate their differences from passive investing. This practical webinar covers how to implement a passive investing strategy when you are purchasing investments, including do-it-yourself methods and done-for-you solutions. The best place to house your IRA is a brokerage firm, but how do you decide among all the options? This webinar covers what factors to consider when selecting a brokerage firm for your retirement account, including a comparison among several industry leaders. When it comes to maximizing your wealth in retirement, nothing matters more than your savings rate – even the investments you choose. Put your energy into increasing your savings rate with the strategies detailed in this webinar!